A crush of new legislation at City Hall could reshape the way landlords do business and raise the stakes on procedures as minute as filing paperwork. Last week, 18 bills hit the City Council docket, aiming to restructure the way New York handles its rent-regulated property owners and the how those landlords deal with their tenants, including buyout negotiations. 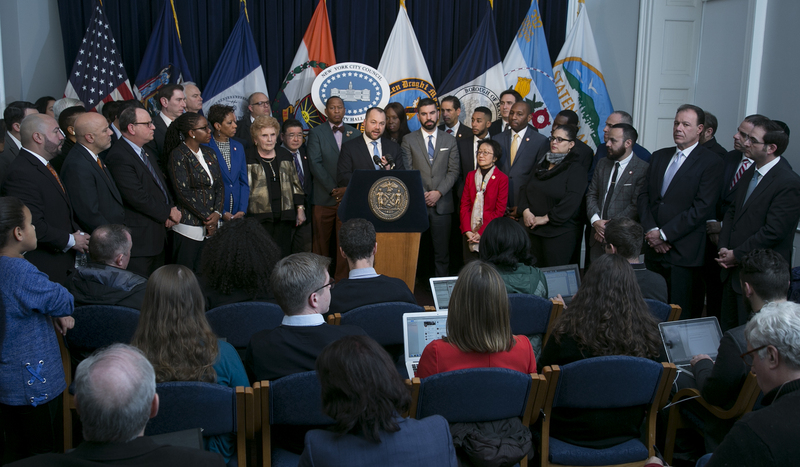 Collectively, the proposed legislation, which has the backing of the council’s Democratic majority, would force rent-regulated building owners to be more transparent, broaden government oversight and give teeth to enforcement measures taken against bad actors, all in the name of protecting tenants. However, some in the real estate industry worry the bills go too far and threaten to have a chilling effect on the market by making it even harder for landlords to operate. Several bills target the filing of false information with the Buildings Department, one of which would double the fines imposed on filers who, for example, do not disclose the presence of rent-regulated tenants in their properties. This comes, in part, as a response to a controversy that flared up last year when it was revealed that Kushner Companies failed to disclose the presence of rent-regulated tenants 42 times in 17 properties while filing applications with DOB. The company maintains that the violations were clerical oversights made by a third-party firm that filed on its behalf. Other bills would impose new sanctions on both the filing company and the individual responsible for the mistake; make sanctions mandatory, and require that punished individuals or organizations be tracked in an online database. Names of architects and engineers who file documents with false or inaccurate information would have to be disclosed, too. While these stipulations might appear reasonable at first blush, Belkin said the lack of requirements to prove intent sets a dangerous precedent. Keith Powers was one of the 12 council members who introduced a bill in the bundle of 18. His legislation would deny building permits to property owners for one year if they are caught lying about the number of occupied units in their buildings. Powers told Real Estate Weekly’s sister publication, Town & Village, the bills are intended to crack down on bad actors and improve coordination between oversight agencies. “We hope this will disincentivize (owners) from making false documentation on a construction application,” Powers said, adding that he expects to have a hearing later this month or in January. Should the package of bills pass into law, landlords would be required to provide the rental history of their units from the past four years to new tenants; share any buyout offers made to rent-regulated tenants with the city and, ultimately, disclose the terms of a finalized buyout agreement. Belkin said making buyout information public could cause problems for tenants — some of whom receive hundreds of thousands of dollars for leaving their rent-regulated apartments. “Trying to scare regulated tenants into never accepting a buyout,” he said. Belkin also argues that such disclosures would be unfair to property owners trying to negotiate legitimate business transactions. “You don’t have a law saying on Black Friday sales that Macy’s needs to put in writing that if you wait until after Christmas you can buy it for 20 percent cheaper,” Belkin said. “Lord & Taylor doesn’t have to say you don’t have to buy it here because Saks is going out of business and has better sales. Also included in the package are additional online disclosures and a requirement for tenants to be invited to DOB hearings. Contractors could be required to submit “tenant protection plans” and the DOB would have greater access to inspect certain properties. John Banks, president of the Real Estate Board of New York, encouraged the City Council to take a level-headed approach to any new legislation to make sure it specifically hits bad actors without saddling the majority of landlords with undue costs or regulations. “According to research recently published by the Regional Plan Association, a small handful of landlords are responsible for a disproportionate amount of the city’s poor housing and eviction cases,” Banks said in a statement.